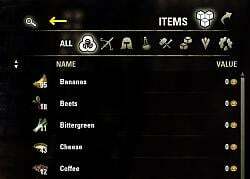 This add-on enables the build-in search box of the inventory and decorates it, so that it fits the ESO style much better. This addon can be used stand-alone or with Advanced Filter or FilterIt. And if you think you don't need a search box using Advanced Filter/FilterIt, you can hide it again with this addon. Guild bank search box fixes included now. Dieses Addon blendet die im Inventar standardmäßig ausgeblendete Suchmaske ein und passt das Einscheinungsbild an, damit es besser zum ESO Stil passt. Das Addon kann allein oder mit Advanced Filter oder FilterIt benutzt werden. Und falls ihr der Meinung seit, dass ihr mit Advanced Filter/FilterIt auch ohne Suchmaske auskommt, kann die Suchmaske mit diesem Addon auch wieder ausgeblendet werden. - Update to french translation. Thanks to @lexo1000. - Using LibTextFilter from AwesomeGuildStore for advanced text filter syntax. - Upon wish of @KL1SK, the author of 'Perfect Pixel', the searchbox is re-anchored a more compatible way. - Added search box to guild history. Requested by @Marazota. - Fixed visibility of "Craft Bag Extended" symbols after tab switch, if "Keep Search Text" is enabled. - "Quick Slot" search box also applies to quest items and collectibles, now. - Added search box to "Quick Slot" inventory window. As requested. - Search in master writ description. As requested. - Search Box at "Buy" tab. - Bring back libCommonInventoryFilters rev. 10. It was still rev. 9 in the PTS folder. - New option: Use sticky search text for all tabs. - Update to libCommonInventoryFilters rev 10: Fix Trading House error. line 19. - Added search boxes to Improvement, Deconstruction and Transmutation Station. - Update to libCommonInventoryFilters rev 1.9: Fix Trading House error. - Right-click search box clears text. Was requested. - Compatibility with "Craft Bag Extended" II. - Compatibility with "Craft Bag Extended". - Multiple search. Split by '+'. - Update to libCommonInventoryFilters rev 1.6. - Localization. Thanks to @lexo1000 for french translation. - Search includes set names. - ESO 2.5 (Shadows of the Hist) ready. - Update to LibHarvensAddonSettings 7.1: Fixing name plate loosing settings. * Still working in ESO 2.2 (Orsinium) as "out-dated", which is in fact "pre-dated" or use Fast API. - Include guild bank search box fixes. Thanks to Circonian. - Add a close button: Clear filter with single click instead of click to focus and press ESC. Also having the issue where the spyglass is there but cannot click it to activate the search bar. Using Bandit UI and Advanced Item Filters. Very rarely it will work, but not sure what the difference between those times and most times when it doesn't is. Maybe a keybind could be added to activate the search bar? Last edited by ProgenitorX : 04/24/19 at 11:14 AM. I also had this issue that you're having. I went through and, one by one, I disabled all my addons aside from the search box. That one that seemed to solve the issue was Tamriel Trade Centre. Which is a bit of a blow, because I use that quite often. Don't know if this helps narrow down what the actual issue is. Hey, thanks for the suggestion! I tried it here, no difference as the search is still a good inch higher on my screen than where it should be. I'm continuing to exoeriment as I get time. That makes sense, because could not find anything in TTC which could have to do with the searchbox. It is still strange, that it had an effect for Troodon80. I could not reproduce it yet. But I have not tested all your addons so far. I have read all the comments and suggestions re changing a setting in AGS. 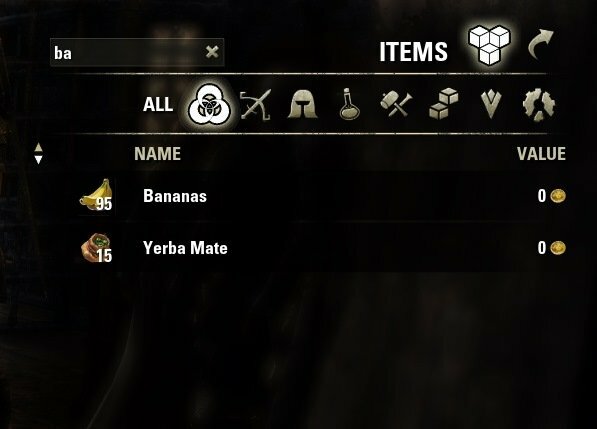 but even with that setting modified I am still not getting a text search in the proper place in my inventory view (I). I modify the setting and /reloadui as it suggests and it works, until of course the next time I log in at which point it's back to where it was, unusable, pre AGS setting change. Willing to accept any and all suggestions. I still have to reload the UI every time I want to search either my inventory or the bank to get the search box back down to where it should be. Is there no fix for this? @zurbit Please give me your list of addons. In terms of Library addons Votan's Addon List is there along with a host of others. One item of note and it made no difference after I added it, after Shadowshire posted their error message *which I never had* you questioned how they could not have libCommonInventoryFilters. Just confirming I never had it before I downloaded it separately. If you want the complete list of Libraries, just let me know. You are missing libCommonInventoryFilters. How is this possible ??? Will to accept any and all suggestions. I am also experiencing the same issue where the search icon jumps up and no search box is presented as a result of clicking on the search icon. I also have AwesomeGuildStore (1.0.0-beta) enabled. I also have some characters where it works as designed while others get the bug issue. 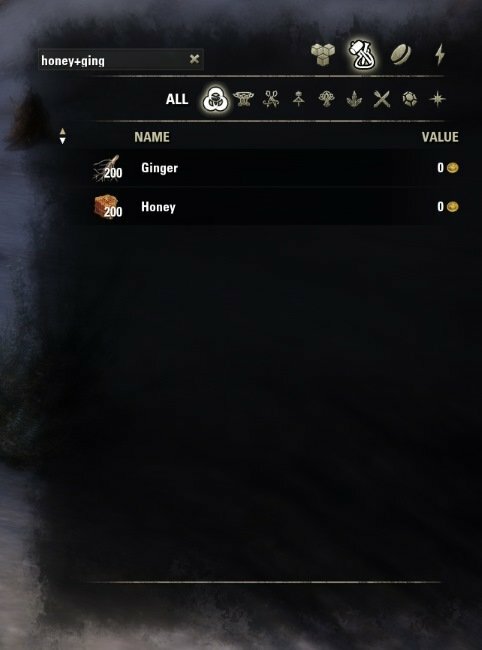 I do have many other addons active, so I will try disabling all but this one to see if the issue is still present for one of the characters that is experiencing this bug. Thanks for the post KLISK, that seems to have resolved the search button's jump and no field issue. I am using latest version: SB v1.6.0 and PP v0.9.985. Both updated in Minion anyway. Only that particular UI seems bugged atm. I am using AwesomeGuildStores as well btw, but I don't think AGS touches the Sell tab. In AGS, enable "Disable custom selltab filter" this should help. Seems to be the similar problem with Bandits User Interface , except this is on the inventory screen (possibly elsewhere too). Search icon jumps up and the search box itself have vanished. That's good to know, because I can not reproduce yet. Last edited by daimon : 03/10/19 at 05:08 AM.